1 A None No Power Seat 1 A is a standard Business Class seat located at a bulkhead that transforms into an angled flat bed. The proximity to the galley and lavatory area might be bothersome. 1 C None No Power Seat 1 C is a standard Business Class seat located at a bulkhead that transforms into an angled flat bed. The proximity to the galley and lavatory area might be bothersome. 1 D None No Power Seat 1 D is a standard Business Class seat located at a bulkhead that transforms into an angled flat bed. The proximity to the galley and lavatory area might be bothersome. 1 F None No Power Seat 1 F is a standard Business Class seat located at a bulkhead that transforms into an angled flat bed. The proximity to the galley and lavatory area might be bothersome. 1 G None No Power Seat 1 G is a standard Business Class seat located at a bulkhead that transforms into an angled flat bed. The proximity to the galley and lavatory area might be bothersome. 1 H None No Power Seat 1 H is a standard Business Class seat located at a bulkhead that transforms into an angled flat bed. The proximity to the galley and lavatory area might be bothersome. 1 K None No Power Seat 1 K is a standard Business Class seat located at a bulkhead that transforms into an angled flat bed. The proximity to the galley and lavatory area might be bothersome. 12 A None No Power Seat 12 A is a standard Economy Class seat with extra legroom that LATAM Brasil designates as a Space + seat. The tray table and the personal TV are in the armrest making the armrest immovable and slightly reducing seat width. There is no floor storage for this seat during take-off or landing. 12 B None No Power Seat 12 B is a standard Economy Class seat with extra legroom that LATAM Brasil designates as a Space + seat. The tray table and the personal TV are in the armrest making the armrest immovable and slightly reducing seat width. There is no floor storage for this seat during take-off or landing. 12 C None No Power Seat 12 C is a standard Economy Class seat with extra legroom that LATAM Brasil designates as a Space + seat. The tray table and the personal TV are in the armrest making the armrest immovable and slightly reducing seat width. There is no floor storage for this seat during take-off or landing. 12 D None No Power Seat 12 D is a standard Economy Class seat with extra legroom that LATAM Brasil designates as a Space + seat. The tray table and the personal TV are in the armrest making the armrest immovable and slightly reducing seat width. There is no floor storage for this seat during take-off or landing. 12 E None No Power Seat 12 E is a standard Economy Class seat with extra legroom that LATAM Brasil designates as a Space + seat. The tray table and the personal TV are in the armrest making the armrest immovable and slightly reducing seat width. There is no floor storage for this seat during take-off or landing. 12 F None No Power Seat 12 F is a standard Economy Class seat with extra legroom that LATAM Brasil designates as a Space + seat. The tray table and the personal TV are in the armrest making the armrest immovable and slightly reducing seat width. There is no floor storage for this seat during take-off or landing. 12 G None No Power Seat 12 G is a standard Economy Class seat with extra legroom that LATAM Brasil designates as a Space + seat. The tray table and the personal TV are in the armrest making the armrest immovable and slightly reducing seat width. There is no floor storage for this seat during take-off or landing. 12 H None No Power Seat 12 H is a standard Economy Class seat with extra legroom that LATAM Brasil designates as a Space + seat. The tray table and the personal TV are in the armrest making the armrest immovable and slightly reducing seat width. There is no floor storage for this seat during take-off or landing. 12 J None No Power Seat 12 J is a standard Economy Class seat with extra legroom that LATAM Brasil designates as a Space + seat. The tray table and the personal TV are in the armrest making the armrest immovable and slightly reducing seat width. There is no floor storage for this seat during take-off or landing. 12 K None No Power Seat 12 K is a standard Economy Class seat with extra legroom that LATAM Brasil designates as a Space + seat. The tray table and the personal TV are in the armrest making the armrest immovable and slightly reducing seat width. There is no floor storage for this seat during take-off or landing. 16 A None No Power Seat 16 A is a standard Economy Class seat that has limited recline and whose proximity to the lavatory may be bothersome. 16 B None No Power Seat 16 B is a standard Economy Class seat that has limited recline and whose proximity to the lavatory may be bothersome. 16 C None No Power Seat 16 C is a standard Economy Class seat that has limited recline and whose proximity to the lavatory may be bothersome. 16 D None No Power Seat 16 D is a standard Economy Class seat that has limited recline and whose proximity to the lavatory may be bothersome. 16 E None No Power Seat 16 E is a standard Economy Class seat that has limited recline and whose proximity to the lavatory may be bothersome. 16 F None No Power Seat 16 F is a standard Economy Class seat that has limited recline and whose proximity to the lavatory may be bothersome. 16 G None No Power Seat 16 G is a standard Economy Class seat that has limited recline and whose proximity to the lavatory may be bothersome. 17 H None No Power Seat 17 H is a standard Economy Class seat that has limited recline and whose proximity to the lavatory may be bothersome. 17 J None No Power Seat 17 J is a standard Economy Class seat that has limited recline and whose proximity to the lavatory may be bothersome. 17 K None No Power Seat 17 K is a standard Economy Class seat that has limited recline and whose proximity to the lavatory may be bothersome. 18 D None No Power Seat 18 D is a standard Economy Class seat with extra legroom that LATAM Brasil designates as a Space + seat. The proximity to the lavatories may be bothersome. The tray table and the personal TV are in the armrest making the armrest immovable and slightly reducing seat width. There is no floor storage for this seat during take-off or landing. 18 E None No Power Seat 18 E is a standard Economy Class seat with extra legroom that LATAM Brasil designates as a Space + seat. The proximity to the lavatories may be bothersome. The tray table and the personal TV are in the armrest making the armrest immovable and slightly reducing seat width. There is no floor storage for this seat during take-off or landing. 18 F None No Power Seat 18 F is a standard Economy Class seat with extra legroom that LATAM Brasil designates as a Space + seat. The proximity to the lavatories may be bothersome. The tray table and the personal TV are in the armrest making the armrest immovable and slightly reducing seat width. There is no floor storage for this seat during take-off or landing. 18 G None No Power Seat 18 G is a standard Economy Class seat with extra legroom that LATAM Brasil designates as a Space + seat. The proximity to the lavatories may be bothersome. The tray table and the personal TV are in the armrest making the armrest immovable and slightly reducing seat width. There is no floor storage for this seat during take-off or landing. 19 A None No Power Seat 19 A is a standard Economy Class seat with extra legroom that LATAM Brasil designates as a Space + seat. The Exit Door protrusion and the proximity to the lavatories may be bothersome. The tray table and the personal TV are in the armrest making the armrest immovable and slightly reducing seat width. There is no floor storage for this seat during take-off or landing. 19 B None No Power Seat 19 B is a standard Economy Class seat with extra legroom that LATAM Brasil designates as a Space + seat. The proximity to the lavatories may be bothersome. The tray table and the personal TV are in the armrest making the armrest immovable and slightly reducing seat width. There is no floor storage for this seat during take-off or landing. 19 C None No Power Seat 19 C is a standard Economy Class seat with extra legroom that LATAM Brasil designates as a Space + seat. The proximity to the lavatories may be bothersome. The tray table and the personal TV are in the armrest making the armrest immovable and slightly reducing seat width. There is no floor storage for this seat during take-off or landing. 19 H None No Power Seat 19 H is a standard Economy Class seat with extra legroom that LATAM Brasil designates as a Space + seat. The proximity to the lavatories may be bothersome. The tray table and the personal TV are in the armrest making the armrest immovable and slightly reducing seat width. There is no floor storage for this seat during take-off or landing. 19 J None No Power Seat 19 J is a standard Economy Class seat with extra legroom that LATAM Brasil designates as a Space + seat. The proximity to the lavatories may be bothersome. The tray table and the personal TV are in the armrest making the armrest immovable and slightly reducing seat width. There is no floor storage for this seat during take-off or landing. 19 K None No Power Seat 19 K is a standard Economy Class seat with extra legroom that LATAM Brasil designates as a Space + seat. The Exit Door protrusion and the proximity to the lavatories may be bothersome. The tray table and the personal TV are in the armrest making the armrest immovable and slightly reducing seat width. There is no floor storage for this seat during take-off or landing. 2 C None No Power Seat 2 C is a standard Business Class seat that transforms into an angled flat bed. 2 H None No Power Seat 2 H is a standard Business Class seat that transforms into an angled flat bed. 2 K None No Power Seat 2 K is a standard Business Class seat that transforms into an angled flat bed. 32 D None No Power Seat 32 D is a standard Economy Class seat with limited recline and whose proximity to the galley may be bothersome. 32 E None No Power Seat 32 E is a standard Economy Class seat with limited recline and whose proximity to the galley may be bothersome. 32 F None No Power Seat 32 F is a standard Economy Class seat with limited recline and whose proximity to the galley may be bothersome. 32 G None No Power Seat 32 G is a standard Economy Class seat with limited recline and whose proximity to the galley may be bothersome. 33 A None No Power Seat 33 A is a standard Economy Class seat with limited recline and whose proximity to the galley may be bothersome. 33 B None No Power Seat 33 B is a standard Economy Class seat with limited recline and whose proximity to the galley may be bothersome. 33 C None No Power Seat 33 C is a standard Economy Class seat with limited recline and whose proximity to the galley may be bothersome. 33 H None No Power Seat 33 H is a standard Economy Class seat with limited recline and whose proximity to the galley may be bothersome. 33 J None No Power Seat 33 J is a standard Economy Class seat with limited recline and whose proximity to the galley may be bothersome. 33 K None No Power Seat 33 K is a standard Economy Class seat with limited recline and whose proximity to the galley may be bothersome. 34 A None No Power Seat 34 A is a standard Economy Class seat with extra legroom that LATAM Brasil designates as a Space + seat. The Exit Door protrusion and the proximity to the lavatories may be bothersome. The tray table and the personal TV are in the armrest making the armrest immovable and slightly reducing seat width. There is no floor storage for this seat during take-off or landing. 34 B None No Power Seat 34 B is a standard Economy Class seat with extra legroom that LATAM Brasil designates as a Space + seat. The tray table and the personal TV are in the armrest making the armrest immovable and slightly reducing seat width. There is no floor storage for this seat during take-off or landing. 34 C None No Power Seat 34 C is a standard Economy Class seat with extra legroom that LATAM Brasil designates as a Space + seat. The tray table and the personal TV are in the armrest making the armrest immovable and slightly reducing seat width. There is no floor storage for this seat during take-off or landing. 34 H None No Power Seat 34 H is a standard Economy Class seat with extra legroom that LATAM Brasil designates as a Space + seat. The tray table and the personal TV are in the armrest making the armrest immovable and slightly reducing seat width. There is no floor storage for this seat during take-off or landing. 34 J None No Power Seat 34 J is a standard Economy Class seat with extra legroom that LATAM Brasil designates as a Space + seat. The tray table and the personal TV are in the armrest making the armrest immovable and slightly reducing seat width. There is no floor storage for this seat during take-off or landing. 34 K None No Power Seat 34 K is a standard Economy Class seat with extra legroom that LATAM Brasil designates as a Space + seat. The Exit Door protrusion and the proximity to the lavatories may be bothersome. The tray table and the personal TV are in the armrest making the armrest immovable and slightly reducing seat width. There is no floor storage for this seat during take-off or landing. 35 D None No Power Seat 35 D is a standard Economy Class seat with extra legroom that LATAM Brasil designates as a Space + seat. The proximity to the lavatories may be bothersome. The tray table and the personal TV are in the armrest making the armrest immovable and slightly reducing seat width. There is no floor storage for this seat during take-off or landing. 35 E None No Power Seat 35 E is a standard Economy Class seat with extra legroom that LATAM Brasil designates as a Space + seat. The proximity to the lavatories may be bothersome. The tray table and the personal TV are in the armrest making the armrest immovable and slightly reducing seat width. There is no floor storage for this seat during take-off or landing. 35 F None No Power Seat 35 F is a standard Economy Class seat with extra legroom that LATAM Brasil designates as a Space + seat. The proximity to the lavatories may be bothersome. The tray table and the personal TV are in the armrest making the armrest immovable and slightly reducing seat width. There is no floor storage for this seat during take-off or landing. 35 G None No Power Seat 35 G is a standard Economy Class seat with extra legroom that LATAM Brasil designates as a Space + seat. The proximity to the lavatories may be bothersome. The tray table and the personal TV are in the armrest making the armrest immovable and slightly reducing seat width. There is no floor storage for this seat during take-off or landing. 4 A None No Power Seat 4 A is a standard Business Class seat that transforms into an angled flat bed. The proximity to the lavatory and galley may be bothersome. 4 C None No Power Seat 4 C is a standard Business Class seat that transforms into an angled flat bed. The proximity to the lavatory and galley may be bothersome. 4 D None No Power Seat 4 D is a standard Business Class seat that transforms into an angled flat bed. The proximity to the lavatory and galley may be bothersome. 4 F None No Power Seat 4 F is a standard Business Class seat that transforms into an angled flat bed. The proximity to the lavatory and galley may be bothersome. 4 G None No Power Seat 4 G is a standard Business Class seat that transforms into an angled flat bed. The proximity to the lavatory and galley may be bothersome. 4 H None No Power Seat 4 H is a standard Business Class seat that transforms into an angled flat bed. The proximity to the lavatory and galley may be bothersome. 4 K None No Power Seat 4 K is a standard Business Class seat that transforms into an angled flat bed. The proximity to the lavatory and galley may be bothersome. 42 C None No Power Seat 42 C is a standard Economy Class seat that juts out into the aisle and is often bumped into by other passengers. 42 H None No Power Seat 42 H is a standard Economy Class seat that juts out into the aisle and is often bumped into by other passengers. 45 D None No Power Seat 45 D is a standard Economy Class seat whose proximity to the lavatory may be bothersome. 46 A None No Power Seat 46 A is a standard Economy Class seat in the last row of the plane with limited recline. The proximity to the galley and lavatory area may be bothersome. 46 C None No Power Seat 46 C is a standard Economy Class seat in the last row of the plane with limited recline. The proximity to the galley and lavatory area may be bothersome. 46 D None No Power Seat 46 D is a standard Economy Class seat in the last row of the plane with limited recline. The proximity to the galley and lavatory area may be bothersome. 46 E None No Power Seat 46 E is a standard Economy Class seat in the last row of the plane with limited recline. The proximity to the galley and lavatory area may be bothersome. 46 F None No Power Seat 46 F is a standard Economy Class seat in the last row of the plane with limited recline. The proximity to the galley and lavatory area may be bothersome. 46 G None No Power Seat 46 G is a standard Economy Class seat in the last row of the plane with limited recline. The proximity to the galley and lavatory area may be bothersome. 47 H None No Power Seat 47 H is a standard Economy Class seat in the last row of the plane with limited recline. The proximity to the galley and lavatory area may be bothersome. 47 K None No Power Seat 47 K is a standard Economy Class seat in the last row of the plane with limited recline. The proximity to the galley and lavatory area may be bothersome. 5 A None No Power Seat 5 A is a standard Business Class seat located at a bulkhead that transforms into an angled flat bed. 5 C None No Power Seat 5 C is a standard Business Class seat located at a bulkhead that transforms into an angled flat bed. The proximity to the galley may be bothersome. 5 D None No Power Seat 5 D is a standard Business Class seat located at a bulkhead that transforms into an angled flat bed. The proximity to the galley may be bothersome. 5 F None No Power Seat 5 F is a standard Business Class seat located at a bulkhead that transforms into an angled flat bed. The proximity to the galley may be bothersome. 5 G None No Power Seat 5 G is a standard Business Class seat located at a bulkhead that transforms into an angled flat bed. The proximity to the galley may be bothersome. 5 H None No Power Seat 5 H is a standard Business Class seat located at a bulkhead that transforms into an angled flat bed. The proximity to the galley may be bothersome. 5 K None No Power Seat 5 K is a standard Business Class seat located at a bulkhead that transforms into an angled flat bed. 6 F None No Power Seat 6 F is a standard Business Class seat that transforms into an angled flat bed. 7 F None No Power Seat 7 F is a standard Business Class seat that transforms into an angled flat bed. 8 F None No Power Seat 8 F is a standard Business Class seat that transforms into an angled flat bed. Audio Video on Demand (AVOD) is offered in all classes of service with a variety of audio programming available. Audio Video on Demand (AVOD) is offered in all classes of service with a variety of movies and television programs to choose from. 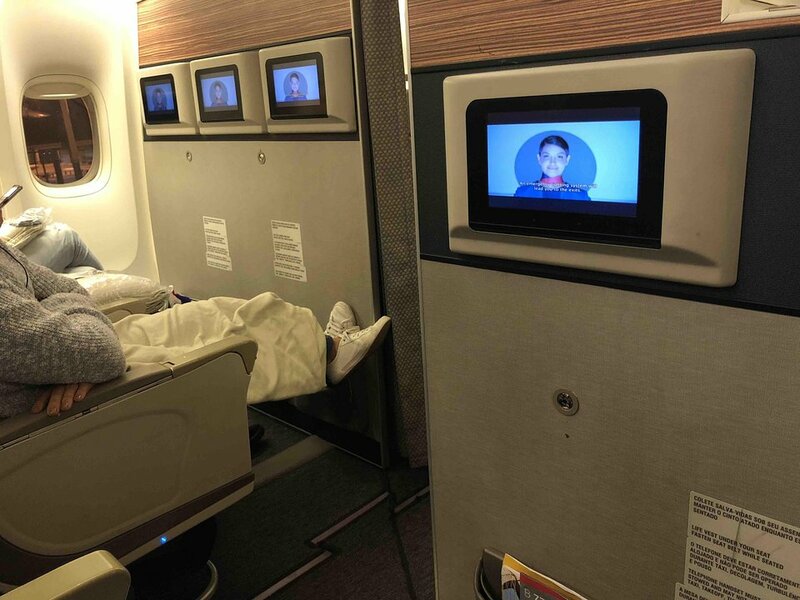 In Business Class, the screen size is 15 inches and in Economy, the screen is 9 inches. AC power is available at every seat in Business Class. In Economy, power ports are made available between seats. This version features 377 seats in a two-class configuration of Business and Economy Class. Business Class has 7 seats across and Economy Class flies in a ten abreast configuration. Rows 12, 18, 19 & 34 ABCHJK and 35 DEFG are Space + seats, which LATAM charges an extra fee to reserve. Space + seats are an Economy Class product, that offer passengers more legroom should they choose to purchase it. Older version with updated entertainment system. Very difficult to sleep if you are over 6ft. Nowhere to put your feet for sleeping position. Travelled to Santiago via Sao Paulo with all four segments in the same aircraft B777. 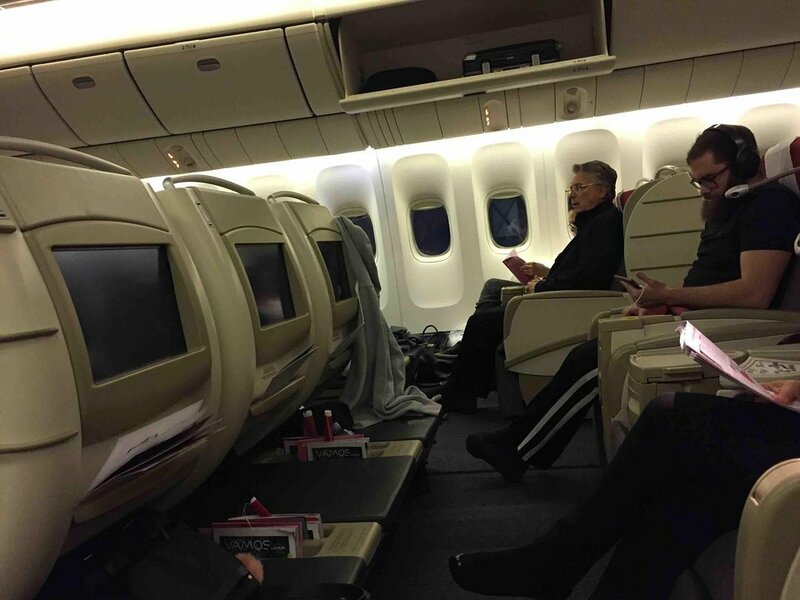 The cabin looks ok and although there are three seats in the middle it still looks spacious. 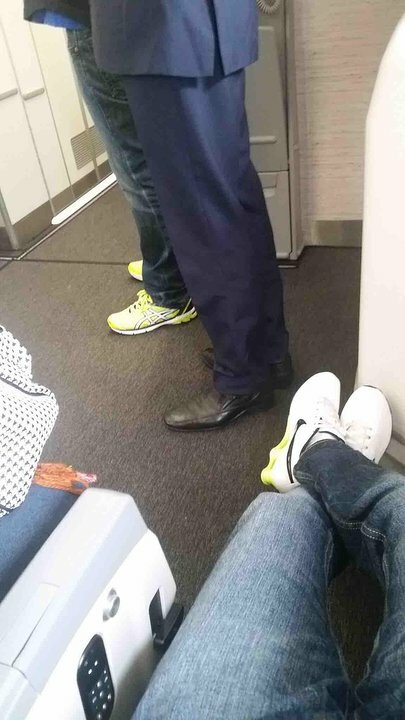 There is enough leg room and a foot rest. Food quality was poor. seat is not very comfortable as it is not fully flat. I just flew on this plane from Sao Paulo(GRU) to Frankfurt(FRA). The width might be ok for short or middle range flights but an absolute NOGO for longdistanceflights. 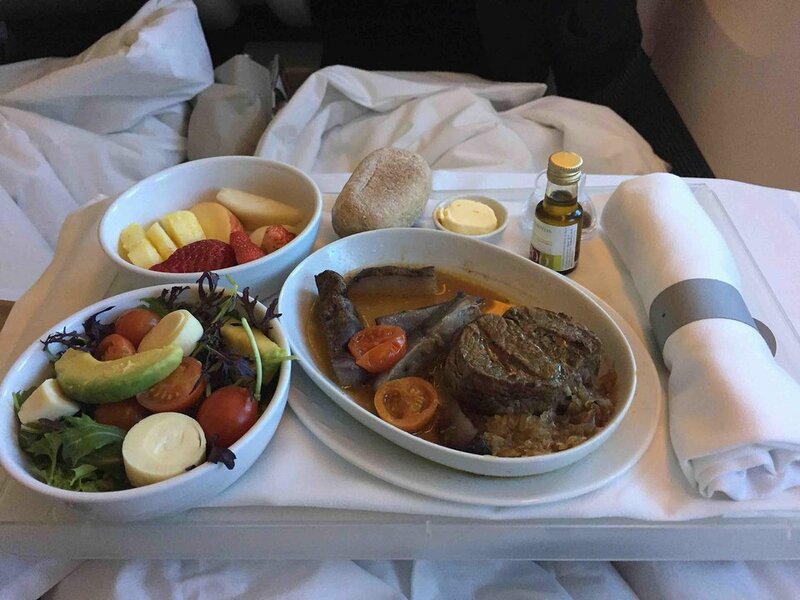 I couldnt move my arms and hands to eat the meals(Low class,fat and not a good taste) like a civilized person. 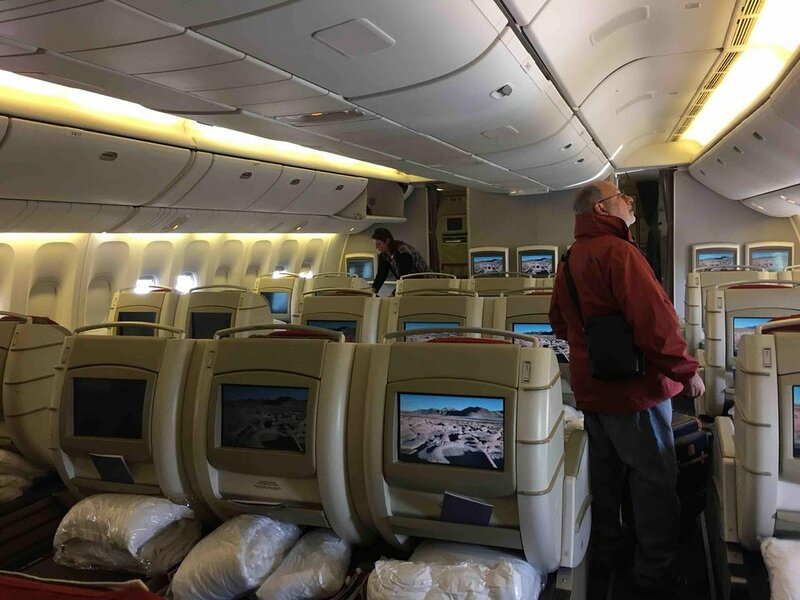 The crew where ignorant and helpless, a lot of passengers said the air condition was much too cold, they didnt changed it, no service between the meals, they said you had to wake up your neighbour and go to the stern of the plane for self-service. Another real bad point is for ALL E and F seats: you have the chairlegs of the row before between your legs. NEVER AGAIN LATAM Brazil! LATAM Brasil flies 1 versions of Boeing 777-300.